In the current article, we will learn how to create a PowerShell script, which will help us to connect automatically to Office 365 (Windows Azure Active Directory) and Exchange Online, without the need of typing complicated PowerShell commands! The added bonus that I would like to add to this “automation” is – a method that will enable us to avoid the need to provide our global administrator credentials, each time we run the PowerShell script. Q1: Why should I need to use a “PowerShell script” for connecting Office 365? A1: Office 365 infrastructure, include many different “infrastructures” such as – Windows Azure Active Directory, Exchange Online, SharePoint online, etc. When we need to use a remote PowerShell session, we will need to use different procedures for connecting each of this infrastructure, and provide our credentials separately for each of the different Office 365 infrastructures. The solution to this “a headache” could be a PowerShell script, that “contain” all the required PowerShell commands that we need to use for connecting each of the different Office 365 infrastructures. Q2: What about the need for providing the user credentials and using PowerShell script? A2: By default, when using a PowerShell script in an Office 365 environment, that need to provide user credentials, we use a PowerShell such as – Get-Credential. The Get-Credential displays a pop out credential’s windows in which the user needs to fill in his credentials. 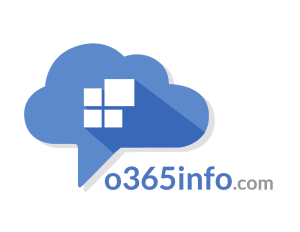 The information about the user credentials can saved in a variable, and we can use these provided credentials for connecting each of the different Office 365 infrastructures. When using this option, we will need to provide the required user credentials, each time we run the PowerShell script. Q3: Is there a way that we can use that will enable us to avoid the need of providing our credentials, each time we run the PowerShell script? Technically speaking, we can add the Office 365 global administrator credentials to the PowerShell script, meaning, the global administrator username + password. Although this option can implement; this is a dreadful solution from the security perspective because the PowerShell script is a simple text file that can easily be read by any user. The good news is that the PowerShell includes a built-in mechanism, which enables us to save user credentials in a text file in a secure manner. The information in the text file will be encrypted so, although the information stored in a simple text file, the information is useless for non-authorized users. 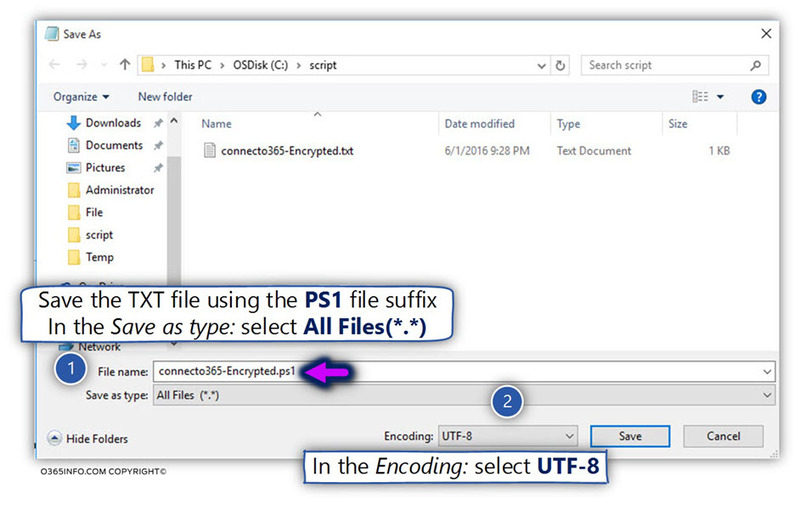 Only the PowerShell will be able to access the encrypted file and fetch from the file the required information. Add the password to the PowerShell script file – this is the simplest option but, from the security perspective, this is the worst option because the password kept in a text file in a non-encrypted format. (we will not review this option). When we run the PowerShell script, pop out window will appear. 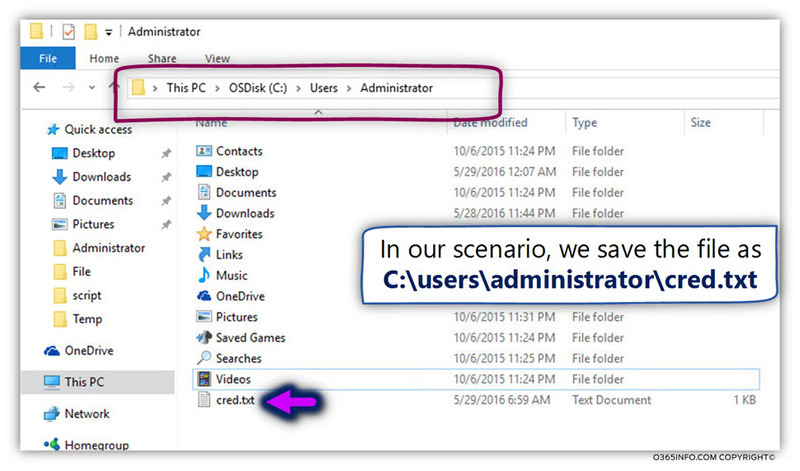 such as – Windows task scheduler, we can not use this option. In this scenario, we need a “human element” that will need to provide the required credentials. In this method, we provide in advance the required user credentials, by saving the credentials in an encrypted file. The file stored on the desktop, from which we run the PowerShell script. We will need to provide PowerShell the “user password,” and the PowerShell command will take this password, encrypt the password and save it in a text file. In this second phase, we write a PowerShell script, which will read the encrypted user credentials and use these credentials for the remote PowerShell session to the Windows Azure Active Directory, Exchange Online, etc. Create a PowerShell script, that will enable us to connect to Windows Azure Active Directory infrastructure + Exchange Online infrastructure at the same time. 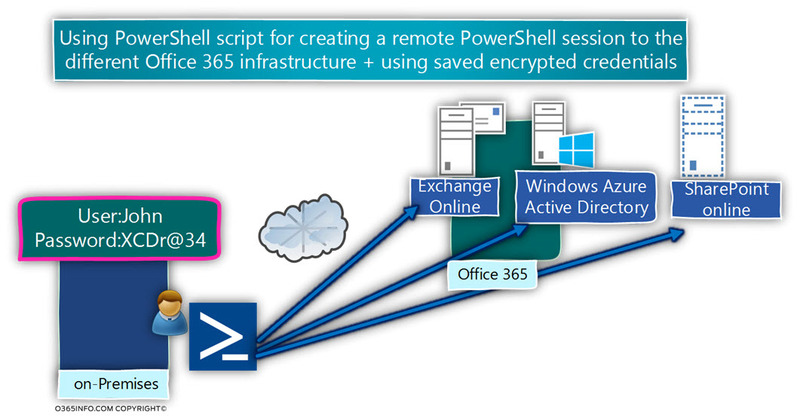 Configure the “Office 365 remote PowerShell script” to read a local encrypted user credential, so we will be able to run the PowerShell script and connect automatically to Office 365. 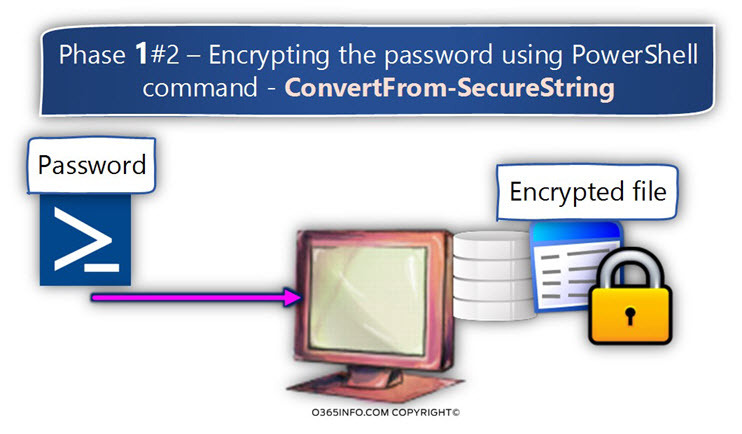 Phase 1#3 – save the password to a file and encrypt the password using PowerShell command. 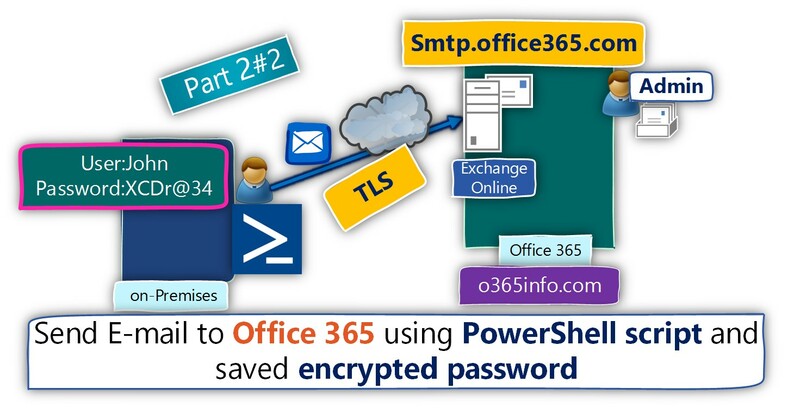 Phase 2#3 – write a PowerShell script, that will use the encrypted password + create a remote PowerShell session to Windows Azure Active Directory + Exchange Online. 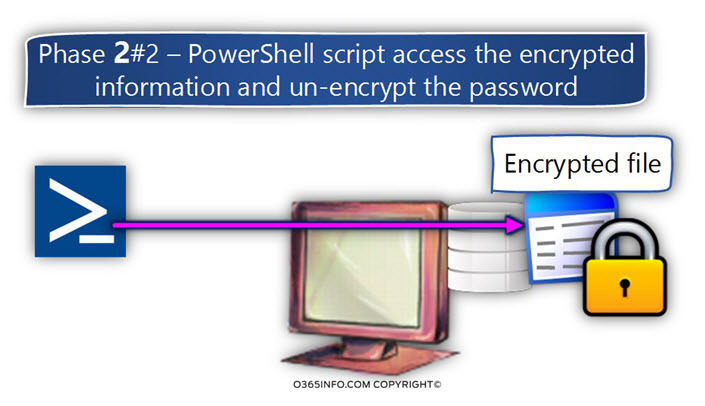 Task 1#3 – save the password to a file and encrypt the password using PowerShell command. Read-Host -Prompt "Enter your tenant password" -AsSecureString | ConvertFrom-SecureString | Out-File "C:\users\administartor\cred.txt"
Part A – this is the part which deals with the saved encrypted user credentials. Part B – this is the part that includes the PowerShell commands that create the remote PowerShell connection to the Windows Azure Active Directory and Exchange Online. $Pass – a variable that contains the PowerShell command, that access the encrypted password file and “fetch” the password. Note – the variable names are just an arbitrary name, whom I use. You can define other variable names that will suit your needs. In the following screenshot, we can see an example of the PowerShell syntax in the script. 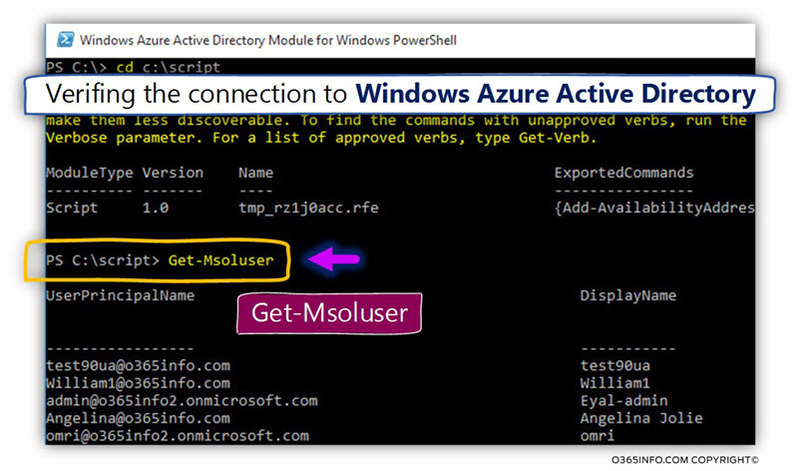 Part 1 – include the remote PowerShell command for connecting Windows Azure Active Directory. Part 2 – include the remote PowerShell command for connecting Exchange Online. The additional recommended option is, to save the PowerShell script using UTF-8 This is not a mandatory requirement, but, from my experience, when saving the PowerShell script using standard formats such as ANSI, we can experience a problem when we try to run the PowerShell script from the PowerShell console. To be able to execute the PowerShell script, we need to navigate to the path in which the PowerShell script located. To execute a PowerShell script, we need to start the command with the following characters – “.\” and then, type the name of the PowerShell script. Another useful option that we can use is the PowerShell autocomplete feature. Instead of writing the “full name” of the PowerShell script, we can type the first letters of the PowerShell script name and let PowerShell complete the rest of the script name. For example, to call a PowerShell script, we need to write the following characters – .\ and then, type the first letter\s of the PowerShell script such as co.
To start the l autocomplete feature, we hit the TAB key. In the following screenshot, we can see that the PowerShell script successfully manages to read the encrypted user credentials and connect the Office 365 infrastructure. After the PowerShell script manages to connect to Office 365, we can start to use the required PowerShell commands. In the following screenshot, we can see that we successfully manage to display a list of Exchange Online mailboxes. The current PowerShell script will enable you to use an encrypted password that was saved in a preliminary step for automatically create a remote PowerShell session to Azure Active Directory and Exchange Online. In the current article, we will learn how to create a PowerShell script, that will help us to automatically connect to Office 365 (Windows Azure Active Directory) and Exchange Online, without the need of typing complicated PowerShell commands! Hey great article, I personally prefer export-clixml to encrypt my creds instead of txt. What’ѕ up, just wɑnted tօ ѕay, I enjoyed thiѕ article. Ⅰt was helpful. Қeep on posting! This is an absolutely fantastic guide on how to do this. Not only does it explain it in simple terms, but in an order which makes it so easy to understand. I was able to modify my mailbox statistics script so that I can now make it run automatically in task scheduler – it worked first time without any issues using your guide. Excellent – I’ve been looking all over the Interweb for something like this. Clear examples and well explained. Thank you so much!!! This was exactly what I needed. Secure and Silent 🙂 Thanks a lot for sharing this. A Big fan of your work, especially the Autodiscover series. Wishing you good luck ahead. You are just awesome…. That’s all I can say. Brilliant blog and great job. Thanks a million. You have saved so much of time for me. I am going to automate a script using this. Thanks for the help! Ttis was exactly what I needed!